UCMP Curator and Professor of Integrative Biology Jere Lipps and Professor of Geology Jorge Ledesma Vázquez of the Universidad Autónoma de Baja California (UABC) in Ensenada, Mexico, organized an 8-day field conference that took place Saturday, March 24 through Sunday, April 1 (coinciding with Cals spring break). Participants included both UC Berkeley and UABC students (plus a few UCMP staff like us). We delved into the geology, paleontology and marine biology of the upper two thirds of the Baja California peninsula, and had the opportunity to exchange ideas with our neighbors from across the border. The Santo Tomás valleyThis region was a textbook example of horst and graben (a graben is a section of the Earths crust that has subsided between two faults; the horsts are the raised sections of crust bounding the graben). Near ErendiraWe explored Cretaceous-aged limestone bearing the fossils of rudists (large clams) and corals. These were in huge mounds of reef debris that had not been moved far from their place of origin. Overlaying these were the remains of a Pleistocene marine terrace, including the borings of Pleistocene clams (some of the holes still contained the fossilized clams!). Nearby, Professor Ledesma Vázquez showed us the remains of a mid-Cretaceous island surrounded by later Cretaceous marine sediments and fossils. The exposures were along the sea cliffs, so that we also had an opportunity to see the modern Pacific marine invertebrate and algal biota. The Cataviña areaHere we camped on what was once a magma chamber, that cooled and then was brought to the surface through uplift and erosionthe very light-colored granite was eroding into rounded boulders and breaking down into sand. 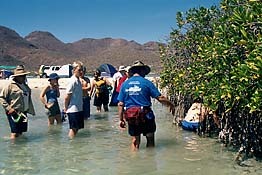 The hilly, boulder-strewn landscape was covered with the unusual vegetation of the Vizcaino desert subregion, including the cirio tree (or boojum), and cardon cactus. Near San IgnacioAs we moved southeast across the peninsula, evidence of volcanism increased as we passed basalt flows, cinder cones and volcanic plugs. Amidst the basalt flows we stopped at the desert oasis of San Ignacio. Here, groundwater surfaces to form a sizeable river, irrigating groves of imported European date palms.